A whole wheat four strand braided Challah from today's class. The flour is a 50/50 mix of white whole wheat and AP. Read more about Holla for Challah! One of my Christmas gifts this year was several pounds of barley and of oats to feed my home milling habit. After noodling around here on TFL and the web, I cobbled together a formula to use some barley flour. Autolyse the flours, malt, water, and honey for 30 minutes. Mix the salt into the dough. Mix the yeast into the dough. Do three sets of stretch and folds at 20-30 minute intervals. When the dough has doubled from its original volume, divide into two pieces. Shape the loaves and place them in prepared bread pans. (I used 8x4 pans but this amount of dough will be more at home in two 9x5 pans.) Ferment the loaves until they have nearly doubled, then bake in a preheated oven at 375F for 50-60 minutes until the internal temperature reaches 195F. Overall, I’m pleased with this bread, considering it was very much a seat of the pants experiment with a flour that I don’t know well. 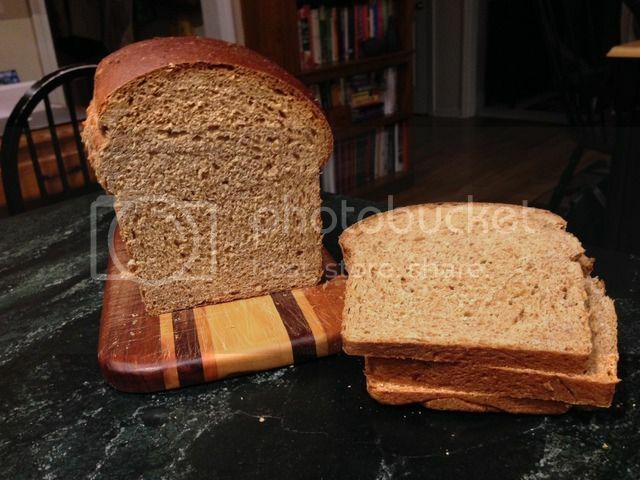 It rose well, is moist, and has a lovely flavor that is milder than a whole wheat bread. The honey isn’t enough to make the bread sweet but it does play up the other flavors. The texture is firm. Although the bread is somewhat more prone to crumbling than an all-wheat bread, it holds together fairly well. The crumb is more open than I had expected, perhaps because of the stretch and folds instead of a more vigorous kneading. The compression visible around the edges is due to excess dough for the pan size, rather than over proofing. Judging from the oven spring, it may actually have been mildly under proofed. I will play with this again. I'm curious to see how molasses would combine with the other flavors, for instance. At 33.3% barley flour, it probably isn’t worth pushing for higher percentages. It is a hefty bread as is and the crumb openness would suffer with an increased barley content. I also wonder if I might nudge the diastatic malt content slightly higher. That might improve the crust browning. If anyone has pointers, I’m open for suggestions. Our oven has been rather busy lately, especially with the Christmas cookies that my wife likes to make at this time of year. In spite of all of that going on, I still managed to work in three different breads yesterday. These gems are essentially fruit and nut loaves lightly glued together with the smallest possible amount of dough. Raisins, golden raisins, chopped figs, pine nuts, and any of hazelnuts/almond/walnuts spend the night in a rum soaker. (I used almonds.) Right alongside those, candied lemon and orange peel have their own beauty bath in white wine. The next day, rye flour, all purpose flour, fennel, anise, cinnamon, nutmeg, cloves, lemon zest, orange zest, sugar, salt, egg, and water after blended into a dough. After the dough has risen, both soakers are combined with the dough. The soakers contribute enough liquid that the dough becomes more of a batter but you soldier on and shape three loaves on parchment or a pan liner. After baking and cooling, the loaves are wrapped or bagged and allowed to ripen for a couple weeks. These should be ready when the kids come to town for New Year. The second bread was Bagguettes with Poolish from Hamelman's Bread, Vol. 2. The baguette choir was singing as these cooled. Since my wife wanted these as the base for crostini, the less than stellar slashing isn’t particularly worrisome and the somewhat bready texture will actually accommodate the toppings better than a wide-open crumb. “It's not a bug; it's a feature!” Or something like that. I used the metric quantities, divided by 10. Per Hamelman, that should yield four 22-inch bagguettes. Knowing that mine would be 15-16 inches in length, I opted to make six instead of four from the same batch. There was a batch of unused blueberry filling lurking in the refrigerator from a recent class, so that was the primary motive for baking these. Were I making them specifically for a holiday gathering, I might have chosen the cranberry filling, instead. Since no one has ever turned these down previously, I don’t expect to hear any grumbling about them this evening. Two blueberry and two peach. We'll make these in tomorrow's Festive Braids class. One of the breads for tomorrow's Festive Braids class. Ian asked that I post something from my bakes (it has been ages). So, here's today’s bread, a simple pain de compagne. It's yeasted, rather than sourdough and will form the base for some DIY grilled cheese sandwiches for tomorrow's class. The other bread the students will make is pain a la ancienne. This was all one batch of dough and the loaves went into the oven at the same time, so I’m not sure why there is such a difference in the amount of oven spring. The most likely explanation, other than shaping differences, is that one pan was on the lower shelf to begin with. That put it closer to the steam pan. Even though the pans were rotated halfway through the bake, the other loaves never expanded as much. Anyway, I do still bake, even though I don’t post nearly as much as I used to. My running debate with myself over whether to buy a mill or do without came to an abrupt end the week before last when I saw a post about a KoMo Fidibus Classic for sale at an attractive price. The new-to-me mill arrived early last week but I wasn’t able to play with it until I purchased some wheat this weekend. My first thought had been to make a 100% whole wheat bread. After some further thinking, I realized that would be more of a test of my baking ability than a real experiment with home milled flour. Happily, I noticed some buttermilk in the refrigerator and thus was born a buttermilk whole wheat bread. And not just one bread but two: one using flour I milled and one using some Pillsbury whole wheat flour that was in the pantry. To the best of my ability, they would be identical in all ways except for the flour. Which means, in real life, that they are exactly similar. The mill worked flawlessly, turning the hard red winter wheat into a steady stream of fine flour that was only slightly more coarse than the Pillsbury flour. Ambient temperature in my kitchen was about 78F and the temperature of the flour exiting the mill was about 117F. The initial mix of the flours, malt, and buttermilk felt quite dry and stiff, so I decided to add enough water to bring the hydration up to 90%. Naturally, I overdosed the bread made with the home milled flour, making it very loose and only just barely manageable. After a short initial mix, each dough was left to autolyse for an hour. When the autolyse was complete, the yeast was added along with approximately a tablespoon of water to make a slurry. The yeast slurry was then mixed in, followed by the salt. Then each dough received 10 minutes of slap and folds. The slap and folds, along with salt, tightened the dough nicely but it was still very wet and sticky. The Pillsbury loaf, having received the correct amount of water, was slightly less sticky. Each dough was allowed to double during bulk fermentation, which took about an hour. Then they were shaped into loaves and allowed to ferment until the dough crested about 3/4 inch above the rim of the pans. The breads were baked at 375F for 45 minutes. When checked with a thermometer, their internal temperature registered 205F, so I deemed them to be done. I'm not sure what caused the difference in oven spring for each loaf, seeing how each had the same bake. 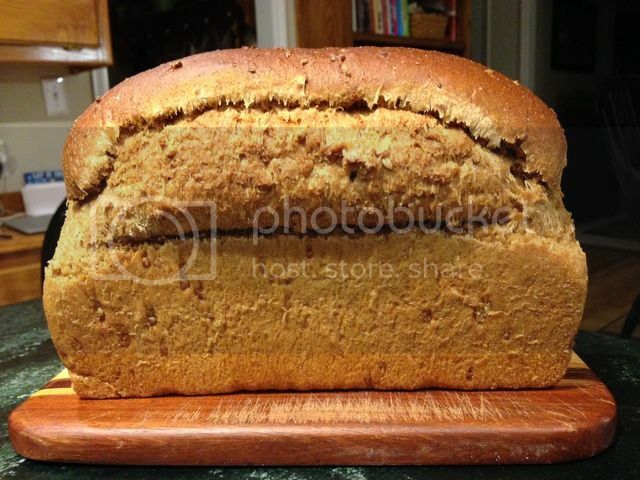 Maybe the extra water in the home milled loaf was a contributing factor. When sliced last evening, both breads were slightly gummy. Oddly, the Pillsbury loaf with the lower hydration seemed gummier, contrary to my preconceptions. As of this morning, the bread is extremely moist but no longer gummy. Apparently it just needed more time for the crumb to stabilize. The flavor differences were more subtle than I expected. The Pillsbury loaf had a faintly bitter flavor note. It could have been the tannins or perhaps it’s an early indication of impending rancidness. 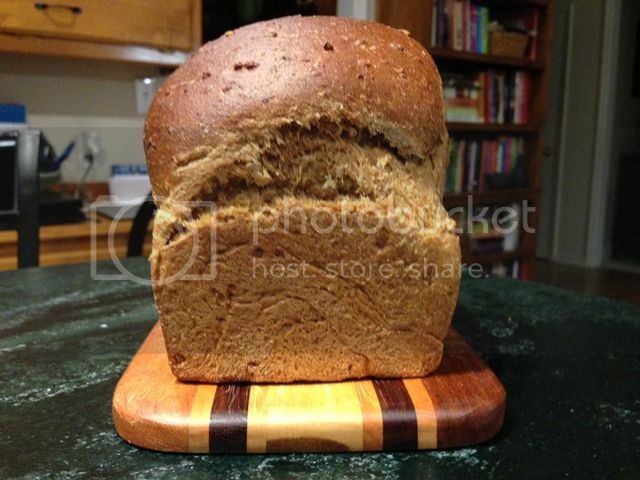 The home milled loaf is slightly sweeter and the grain flavor is more rounded. It's possible that the germ in the home milled flour contributes some additional flavors that are missing from the Pillsbury flour. All in all, I didn’t experience a profound change in flavor that some people report but it was an improvement. If I were to repeat this bread, I would dial back on the hydration; perhaps to 85%. Although the dough seemed rather dry during the initial mix, 90% was rather wet for a panned loaf. Or, keeping the hydration, bake as a hearth loaf instead. Looking forward, I plan to use the mill frequently. It may help the bread texture if I drop the malt content to 0.5% of the home milled flour. If I can locate a local farmer with grain for sale, that would be a plus. There are a whole lot of new possibilities and new learnings to explore. I think it will be fun. Beth Hensperger's Sweet Vanilla Challah, to be precise. These will be appreciation gifts. Okay, the grain bill was different than Hamelman's but the rest of the bread was per the formula. Good stuff! My work schedule is set up so that I get every other Friday off. Or, as my employer puts it, I'm on a 9/80 work schedule. That means Mondays through Thursdays are 9 hours a day, one Friday is 8 hours, and the following Friday is off. I love it. Having a 3-day weekend every other week is a wonderful thing. So, this past Friday, I got to play with some new recipes. The first bake was an Irish soda bread. It turned out wonderfully, in a craggy sort of way, with plenty of spring in the oven. We took it to a neighbor whose mother had died a couple of days previously. Consequently, there are no pictures. It was well received; so much so that I’m not sure any of the extended family actually knew of its existence. The second bread that day was something I'll call an Irish oatmeal porridge bread. 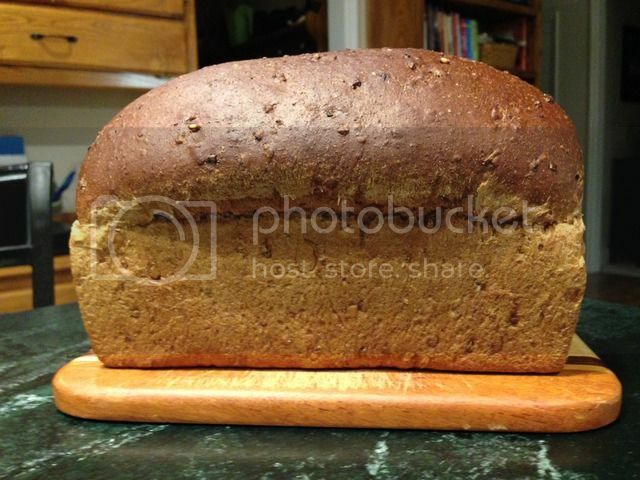 It features cooked steel-cut (or pinhead, or Irish, or Scots) oatmeal, some bread flour, some whole wheat flour, plus some molasses to help boost the flavor. If you aren't acquainted with steel-cut oats, they are fairly analogous to cracked wheat. Each oat kernel is broken into 3-5 pieces as they pass through a set of rollers at the mill. The texture is quite different from rolled oats, even the old-fashioned variety. The cooked porridge is more nubby, a bit more al dente. The dough was a bit drier than I expected. There are two factors that may have been in play. The first is that much of the liquid in the bread is contained in the porridge. If one were to measure the pre-cooked and cooked weight of the porridge, they’d know how much water is lost during the cooking. Of course, one would have to think of that in advance. The second factor is the AP flour in this particular batch of bread. It’s the Eagle Mills Ultragrain flour, which contains 30% white whole wheat flour along with the usual patent flour. The extra fiber content makes it more absorbent than a typical AP flour. Which of those was the greater influence, I can’t say. What was clear was that the dough required more water, probably another 50-60 grams worth before it softened to something less than bagel dough. Note that the dough didn’t feel particularly dry but it was quite stiff to knead. The dough was bulk fermented in a covered bowl, then shaped into a loaf that went into an 8x4 loaf pan. The final proof, covered, went until the dough crested about ¾ of an inch above the pan rim, at which point it went into the preheated oven for baking. If you look closely enough at the crumb, you will notice a compression zone where the dough was in contact with the pan. It appears that the outer extent of the loaf suffered some compaction before the top tore loose and released the pressure. The rest of the crumb is very uniform and is a splendid base for my sandwiches this week. The bread is firm and moist, probably an artifact of the moisture in the porridge, as well has having a degree of chewiness that is definitely due to the steel-cut oats. The molasses, which is one of my favorite flavors, is front and center in both fragrance and taste. I suspect this would also be very good toasted, with nothing more than butter spread on it. I also managed to squeeze in a batch of sandwich rolls on Saturday, yielding 6 hotdog buns and 6 hamburger buns. All in all, it was a fun time in the kitchen this past weekend.